Cole and Ramse are children and they are running through the fields but stop when they come to a foodbank. Cole wants to check it out but Ramse says that they should check it out tomorrow. Never being one to listen, Cole decides to go and check it out. Of course, Cole is attacked from behind. Cole and Ramse are having a drink and Cole still believes that this is all too easy. Ramse reminds Cole about Olivia saying that the Witness would be surrounded by protectors. It's not enough to settle Cole's mind because he cannot wrap his mind around why Olivia would decide to betray the Monkeys now. Ramse points out that The Witness took everything from her. Cole directly asks Ramse if he's certain that isn't a set up and Ramse assures Cole that Olivia wants what they want. Jennifer is sleeping in the splinter room and she has visions. Adler wakes Jennifer and demands that she leave and sleep elsewhere. Jennifer grabs her sketch pad and starts to draw what she saw in her dreams, trying to figure out what it all means. She repeats, "6 or 7 dying man", several times. Jones walks into the room and is not impressed to find Jennifer in her chair or Jennifer's drawings on the wall. Jones focuses in on the drawing of the man dying on the ground and Jennifer reveals that she doesn't know who he is. Cole and Ramse make plans on how to confront the witness. They think back to a family of gun runners from back in the day who ran their shady business out of a bakery and decide to arm themselves by robbing them. Cassie and Deacon embrace and she asks about Cole and he reveals that it's just him. Together, the two begin to sneak out and Deacon explains that Mallick gave him directions out of there. Cassie is shocked because when they left it was 2045. The Pallid man comes across the bodies of Cassie's guards and Mallick claims that Cassie had help in escaping. The Pallid man is determined that Cassie not escape before their next jump and orders Mallick to find Cassie and to get ready to move Titan. Cole enters his room at the Emerson but Ramse has not arrived. Ramse is at the hospital where Cassie works and he places a call to have Cassie paged to the ER. Jennifer wakes after having a vision of a blonde woman lying on the floor covered in blood and she looks at the camera, only to find Olivia staring right back at her. Jennifer decides to visit Olivia's cell. Jennifer instructs Olivia to stop talking like a super villain. Jennifer points out that she stabbed Olivia and she didn't break but supposedly broke after a couple months in the dark. Jennifer determines that Olivia is unbreakable and she blames Olivia for the nightmares she's having. Olivia is back to smiling and is not giving any answers. Jennifer tells Olivia that she's never spent a day anywhere she doesn't want to be. The daughters enter the room and Jennifer instructs them to point their guns at Olivia. Jennifer then enters Olivia's cell and asks Olivia to tell her a story which is going to make the nightmares go away. Staff at the hospital are confused as to why Cassie has been paged to the ER. Cassie arrives and attempts to follow her when she leaves but runs into a locked door. Fortunately for Ramse, a nurse uses his swipe card to open the door so he is able to follow. Ramse pulls out his gun and shoots a blonde woman but it's not Cassie. Out of time, Ramse is forced to leave the hospital and return to the Emerson where Cole is waiting for him. Ramse makes up a story about getting into a scuffle with some guy and Cole is suspicious because it was hours ago. Ramse then lies and claims that he was lost and got on the wrong train. Cole actually believes that Ramse went to see his mother and Ramse says that he only wanted to be close enough to see her face. Ramse shows Cole a picture of Cassie and Cole together and suggests that Cole take a few hours to go and see Cassie in case he doesn't get to see her again. Cole points out that Cassie hasn't met him yet and that he doesn't need to screw up her life. Cole explains that Cassie was in charge of an outbreak at a community center in New York and was there for months in 2007. Cassie and Deacon are still trying to escape and they come across a group of armed Monkeys. Rather than retreating, they decide to fight their way out, armed only with knives. Mallick makes an appearance and stabs the two guards that are accompanying him and encourages Cassie and Deacon to make a run for it. Before Cassie leaves, Mallick instructs her to find her son. Cassie and Deacon manage to leap out of Titan moments before it moves. Ramse brings up Cole's suspicion that this might be a trap. Ramse pulls out a map and suggests that he and Cole split up in case there is a trap. Cole is down with this because this is how they would have approached things in the past. Flashback time. Cole is grabbed from behind as he is approaching the former foodbank and is saved by Ramse, hitting his attacker with a metal pole. Cole and Ramse have arrived at the place they have planned and Cole asks if Ranse is sure that he wants to split up. Ramse says that there's no other way. The two men shake hands and Ramse gets out of the car. Ramse waits for Cole to drive off before stealing a car himself. Deacon and Cassie realise that they are not far from the facility. Deacon asks why they were kept locked up for so long but Cassie says that it doesn't matter now. The Pallid man wants to use the suits in order to change the timeline so that Cassie isn't able to escape. Mallick points out that the suits were only to be used to protect the Witness and that if they alter the timeline to get Cassie back, it could have a serious impact. Mallick even points out that it is unlikely that Cassie's camp is still there. The Pallid man is worried about how this will impact the faithful given Olivia's defection. Mallick suggests not telling the faithful and points out that Witness's return is imminent. The Pallid man suggests that he must execute everyone except for Mallick who was involved in Cassie's imprisonment. Cassie and Deacon arrive at the location of the facility to see that it has been completely destroyed. Jennifer questions who the dead person she sees in her vision is but Olivia simply states that she isn't the one who can see into time. Jennifer declares that the mission is a trap and Olivia has plans into plans. Jennifer realises that one of the things that she saw in her vision was a map created by Olivia with the Witnesses time line. Jennifer surmises that if Olivia had really switched sides, she would have told Jones about the map. The only reason for Olivia to hold back is because she needs one more bargaining chip. Jennifer warns that if something happens to her friends that Olivia is going to need more than a map to save her. Ramse arrives at the location where Cole told him that Cassie was going to be. Cassie is just checking in with security as Ramse moves towards the entrance of the facility. Ramse finds the building locked and hears Cole behind him say, "she's not coming". Cassie is indeed checking in but at a completely different facility than where Cole and Ramse are. Cole orders Ramse to toss his weapon and Ramse turns to face Cole. Cole says that he knew the second Ramse showed up with Olivia but that he wanted to believe that Ramse was acting in good faith. Cole adds that he gave Ramse chance after chance to tell him the truth. When Ramse asked him about Cassie, Cole knew he wasn't telling the truth. They both remember the moment when Cole was grabbed because that's when they became family to each other. Ramse brings up Cole and Cassie's time in 1957, and that Olivia told her the truth. Ramse admits that he came to 2007 to make sure that the Witness was never born. Ramse tells Cole that the Witness is his son and Cole is shocked. Deacon and Cassandra look at the ruins of the facility certain that no one could have survived this. Deacon says that they shouldn't have left Titan and should have instead found the Witness and slit his throat while they had the chance. Cassie however is not going to give up and she starts digging through the rubble convinced that there has to be a way home. It's Deacon however who notices a wall which wasn't there before. On the wall is a marking of a butterfly, reminding Cassie of the butterfly jewelry Cole gave her. Cole calls what happened crazy and says he undid what happened. Ramse asks Cole again why he is still alive and that the Monkeys were protecting Cole and Cassie so the baby would be born. Ramse adds that this is why Cassie was taken to taken. When Cole asks why Ramse didn't tell him, Ramse claims that he was trying to protect Cole because he didn't think Cole could handle it. Ramse asks for permission to kill Cassie because then everything will reset but Cole pulls a gun on him. Ramse knocks the gun out of Cole's hand and takes off running. Cole jumps to his feet and quickly follows. Ramse has a point, Cassie is one life and her death would save billions if not millions of people. Cole finds Ramse and shoots him in the shoulder. Ramse gets to his feet but keeps walking away, as Cole calls out for him to stop. Cole shoots Ramse in the back several times and Ramse goes down again. Cole asks Ramse why he couldn't just trust him and puts his hand on Ramse's bloody chest. Cole promises to fix this and Ramse asks him not to. The two men hold hands and Ramse repeats his request for Cole not to undo this. Ramse tells Cole that he is on his own before dying. Still holding Ramse's hand a crying Cole sits on the ground next to Ramse's body. Cassie is leaving the Fairfax County office when she is approached by a bloody Cole. Cassie goes into doctor mode and offers help. When Cole starts talking about her coming home because he cannot do this alone, Cassie steps back and says that she is going to find someone to help him. When Cassie turns to head back to the facility, Cole splinnters away. Cassie is digging in the ruins and has to stop momentarily when her nose starts to bleed. It seems that when someone changes history in the past it causes a nose bleed in the present. In the rubble, Cassie finds a case with two injections inside. Cole returns without Ramse and is greeted by Jones. Cole walks off without answering any of Jones's questions and arms his gun. Jennifer tries to intercept Cole and tell him about what she has learned but Cole pushes her out of the way. Cole makes his way into Olivia's jail cell and she recognises immediately that he now knows that he is the father of the Witness. Cole puts his gun to Olivia's head and she tells him that they are going to need her to find his son.The alarm starts to go off and Olivia promises Cole that his secret is safe with her. An angry Cole grabs Olivia but lets go and heads to the splinter room instead. Deacon arrives first and is quickly followed by Cassie. It's a good thing that this is a time travelling show because I am not the least bit happy about Ramse being killed off. 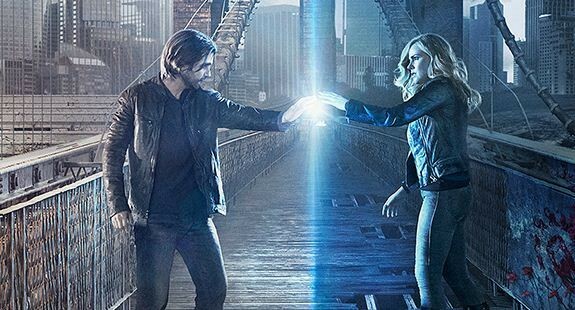 I've said it before but 12 Monkeys has a terrible record when it comes to race. The only other reoccurring character of colour is Whitley and he gets almost no screen time and we know virtually nothing about him. In fact, it's not even fair to call Whitley a character. I know that Cole promised Ramse that he wouldn't undo this but the writers had better fix this post haste. I love that Jennifer is the one who figured out Olivia's little plan. The other characters are constantly discounting her importance though she has proved time and time again just how much she brings to the team. They would be nowhere without her and now because of Jennifer, they know about the map. Now both Cassie and Cole know that they are the parents of the Witness. I have to admit that Ramse's logic about killing Cassie makes so much sense. Without the Witness, there would be no plague and the earth would not be a post apocalyptic mess. Without the Witness, history would have unraveled without being messed with and their lives would be completely different. Sure, some people might disappear from the timeline but over all, if either Cole or Cassie die, so many people would be saved. It's a measure of just how much Ramse cares about Cole that he decided to attempt to kill Cassie and not Cole, even though Cole is the person he had ready access to. With Cole dead, the Witness wouldn't have been born either. I really want to know what Mallick is playing at. Not only did he save Deacon, he set Deacon up to save Cassie. Mallick specifically told Cassie to find her son, which suggests that he doesn't believe in whatever the Witness has planned. This means that there's a mole in the inner circle. What we don't know is why Mallick is doing what he is doing? Given the nature of this show, he could have been ordered to do it by the Witness and so we cannot trust that he's necessarily on side, making him no more reliable than Olivia.